Review: C.C. Baxter is a go-getting office worker. He loans his apartment to be used by his executives for their romantic trysts. This is in the hope that he will be promoted. Here comes a fantastic comedy from actor Jack Lemmon. Superbly directed by Billy Wilder. One of his most classic films. 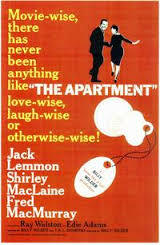 Jack Lemmon is fantastic in this but Shirley MacLaine’s performance is also exceptional. This is the last Black and While film to win Best Picture at The Academy Awards (Oscar Awards) until The Artist (2011). The director originally thought of the idea for the film after seeing Brief Encounter (1945). Billy Wilder directed Some Like It Hot (1959) also staring Jack Lemmon. At the Academy Awards in 1961 this won 5 Oscar Awards. They were for Best Picture (Billy Wilder), Best Director (Billy Wilder), Best Writing, Story and Screenplay – Written Directly for the Screen, Best Art Direction-Set Decoration, Black-and-White and Best Film Editing. At the Golden Globe Awards the same year it won three awards and they were for Best Motion Picture – Comedy, Best Actress – Comedy or Musical (Shirley MacLaine) and also Best Actor – Comedy or Musical (Jack Lemmon). At the Bafta Awards the same year this also won three awards and they were for Best Film from any Source (Billy Wilder), Best Foreign Actor (Jack Lemmon) and also for Best Foreign Actress (Shirley MacLaine).